Unfinished Project: Day 337: What'll Ya Have? Like the Coca-Cola museum and the Georgia Aquarium, eating at the Varsity is just something that tourists do (or should do) when they come to Atlanta. The world's largest drive-in is undoubtedly an institution in the city, and in Athens, Georgia, where I went to college. 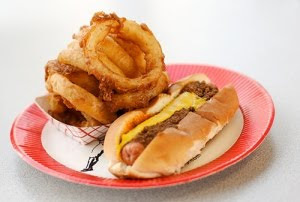 I was introduced to food from the Varsity when I was a student at UGA; a friend of mine's parents brou ght chili dogs and onion rings to a tailgate and I happily ate them both right up before a game. Certain that the grease and calories from that one meal would put me at the risk of gaining the "Freshman 15" and then some, that one experience with the Varsity would be my last. I never actually visited the restaurant in Athens, except once to use the bathroom. 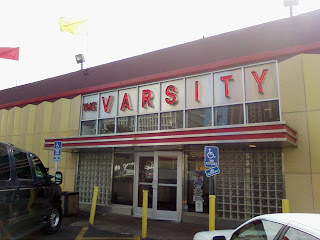 When I moved to Atlanta, the home of the original Varsity, I thought for sure I'd get there eventually. But six years later, I'd never made it. I vowed to change all of that in my 29th year, so after work on Day 337, I jumped in my car and headed to the real-deal Atlanta Varsity to drink a Frosted Orange. I figured this would be an easy task to complete; my office is downtown not very far from the Varsity. Plus I've passed the restaurant multiple times each week for six years. And the restaurant is hard to miss. There is a large sign and big neon red lights. Everyone knows where it is, and can figure out how to get there. Everyone, of course, except for me. I'm on my way, certain that I know exactly where I am going. 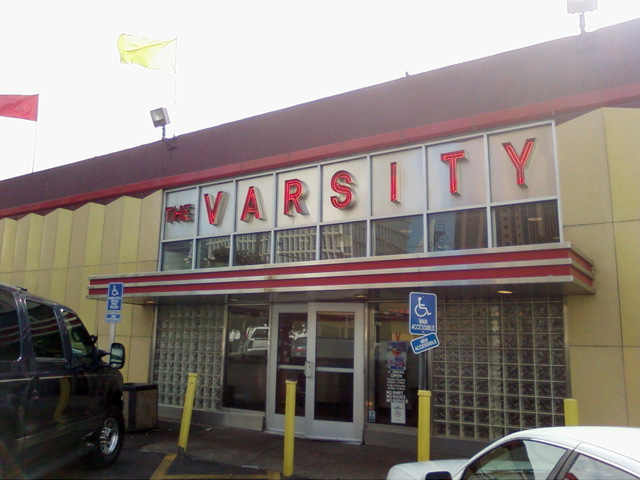 I drove up and down streets assuming that the Varsity would be exactly where it was all of the other times I passed it and never stopped. But after driving for a while, I knew that I had to have driven too far, so I turned around. I drove up and down streets, turned around twice, and nearly made it all the way to Buckhead before I decided to stop the car, pull over, and look up the exact address on my Blackberry. My sense of direction or lack thereof, is truly remarkable. When I did find it, I parked and walked through the doors to find doze ns of people behind a long counter bustling with activity. All of them paused briefly to acknowledge my entrance and almost in unison, they all yelled, "What'll ya have?!" That slogan is what the Varsity is famous for, and it's not just a gimmick. All of the cashiers actually did yell it the moment I walked in. Granted, some say it with more passion and gusto than others. There were several who muttered the words under the breath, terribly uninspired. I had to figure some of them had a bad day. Regardless, the yelling was a bit shocking, especially all at once, especially when I was by myself, especially since I didn’t know what I wanted. I wasn't super hungry, so eating a chili dog and onion rings like I did when I was at UGA seemed excessive. Even though I’ve been out of college for years, I guess there will always be a part of me nervous about gaining the “Freshman 15,” at the hands of Varsity cuisine. Plus, there were so many menu items that I hadn’t yet tried, why not use this opportunity to try something new? I went for a Frosted Orange. Or an, “F.O.,” as it is referred to by the Varsity staff. They have nicknames for all of their menu items (for example, a “naked dog” is a hot dog without anything on it and “bag-o-rags,” is a bag of chips. I’m told that an F.O. 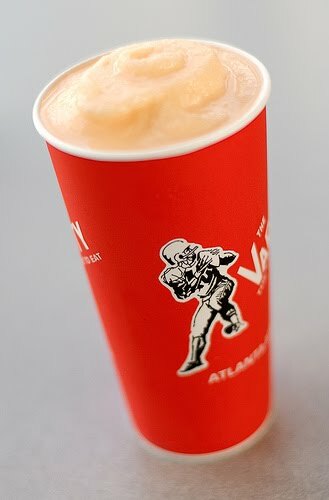 is the frozen ve rsion of the Varsity’s Big Orange (which I’ve never had so I don’t really know). It tastes like a Dreamsicle in milkshake form, which means that it was everything a milkshake should be: Cold. Refreshing. Delicious. 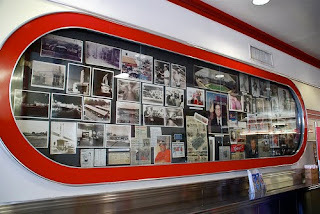 I enjoyed my Frosted Orange while perusing the memorabilia wall full of pictures from when the Varsity first opened and of former Presidents enjoying chili dogs wearing Varsity hats. And I crossed another Atlanta must-see destination off the list. Freshman 15 or not, I think I might have to head back for a chili dog really soon.